Eragrostis spectabilis (Pursh ) Steud. Culms: Stiffly erect to arching, rigid, glabrous. Blades: Flat, 4 to 16 inches long, to 1/3 inch wide, firm, stiffly ascending, often with long hairs on upper surface near base; margins usually rolling inward when dry. Sheaths: Margins overlapping, collar and upper margins with long hairs. Ligules: Short membranes backed by ring of hairs. Inflorescences: Open panicles, 6 to 24 inches long, 4 to 16 inches wide, loosely flowered, about 2/3 height of plant; branches 3 to 10 inches long, somewhat stiff and ascending, spreading at maturity, reddish purple, lower branches shorter than middle branches, branch axils with long hairs. Spikelets: Numerous, on stiff stalks, linear-oblong, about 1/4 inch long, 5-12-flowered, flattened, purplish; awns absent; glumes and lemmas sharply pointed. Habitat: Dry or moist pastures, roadsides, and waste areas, often on sandy sites. Forage Value: Purple lovegrass has fair forage value when young. Cattle will not graze mature plants. Uses: It provides nesting cover for some game birds. Comments: Tufted. 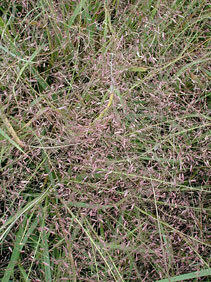 After maturity, the inflorescences often break loose and roll like tumbleweeds.